The EUR/USD currency pair is moving according to the forecast. At the moment we can see the formation of the rising symmetrical pattern, and should expect the price to test the area of the 4th point of reference, 1.3600, which may be considered a starting point of the fall to the rising channel’s lower border in the area of 1.3490. 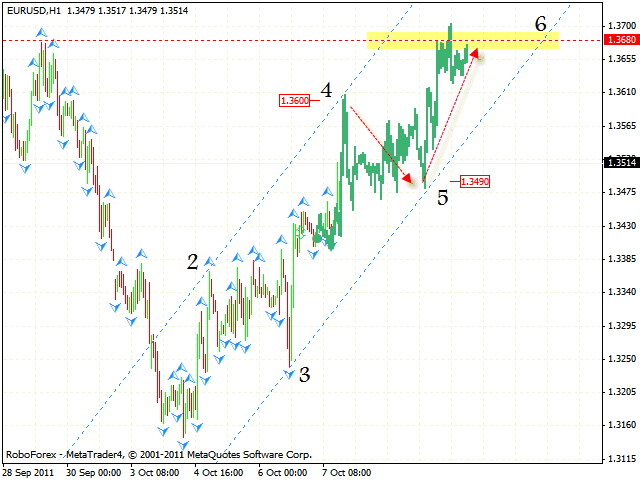 Near the channel’s border one can consider buying the pair with the target in the area of 1.3680. At the H4 chart of Dollar Index the price has broken the trend’s rising line at the RSI, we should expect the start of the descending trend with the target in the area of 73.60. 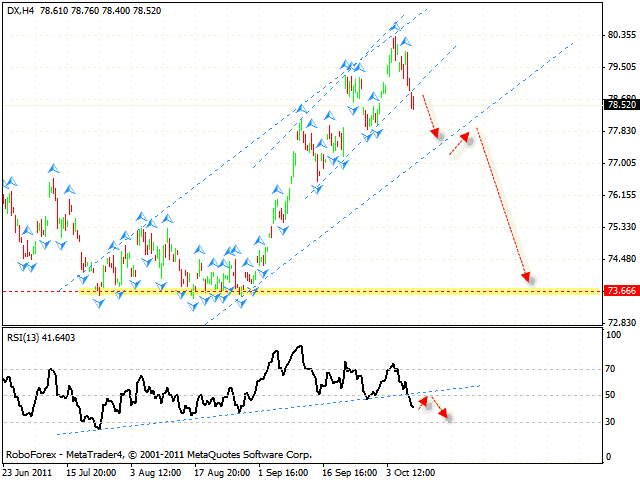 When the RSI indicator returns to the trend’s broken line, one can consider selling Dollar. The price leaving the rising channel will be an additional signal for sales. 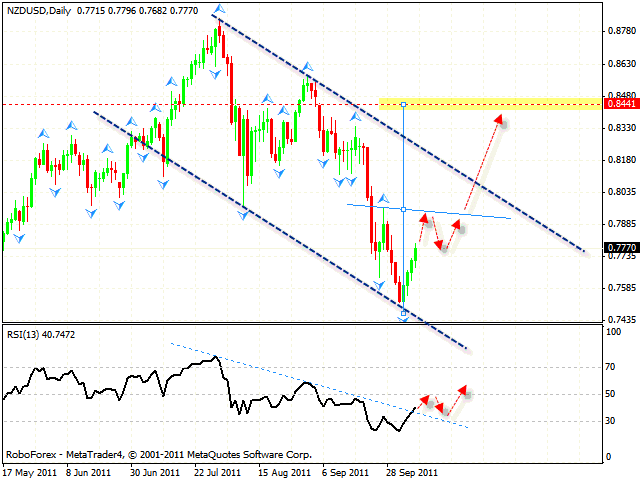 New Zealand Dollar is also moving according to the forecast. At the RSI the trend’s rising line has been broken, and we should expect the price to test the descending channel’s upper border. There is also a possibility that the market may form “head & shoulders” reversal pattern with the target in the area of 0.8440. But if the price reaches new local minimums in the area of 0.7435, this case scenario will be cancelled. At the H1 chart of the EUR/JPY currency pair we can see the formation of the rising symmetrical pattern with the target in the area of 104.80. 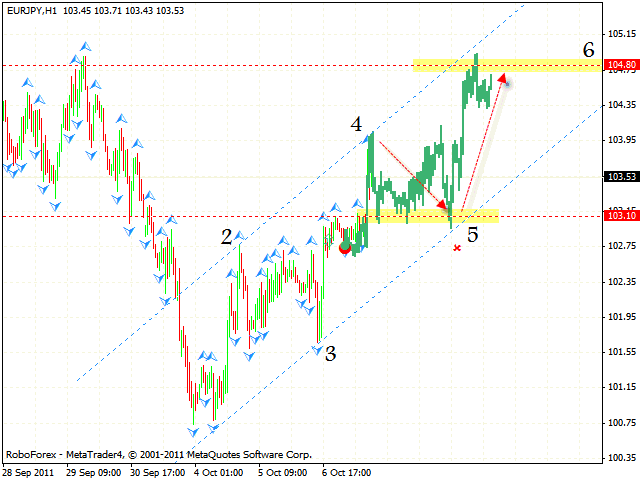 One can consider buying the pair near the support level in the area of 103.10. But if the price breaks the rising channel and leaves it, this case scenario will be cancelled.